The arsenic concentration in the well water during the pilot test ranged between 32 and 38 micrograms per liter (μg/l), which is above the maximum of 10 μg/l allowed by the EPA’s Arsenic Rule and DPH regulations. The color concentration in the well water during the pilot test ranged between 81 and 112 APHA, and the iron concentration ranged between 50 and 240 μg/l. 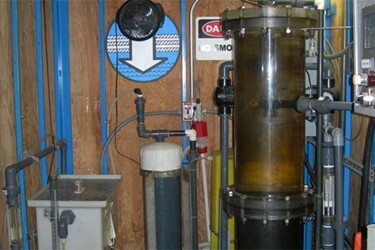 The project specifications require that the finished water from the proposed treatment system shall satisfy the EPA and California Department of Public Health (DPH) regulations and standards, with a raw water arsenic concentration of up to 50 micrograms per liter (μg/l), a color concentration of 120 APHA units, and a pH of 8.9. The DPH Secondary Standards limit the concentration of arsenic in the filtered water to 10 μg/l, and limit the concentration of iron to 300 μg/l. Also, it was desired to reduce the color in the raw water to less than half of its incoming value.